I designed this table to present a cabinet-like appearance from these sides, which face towards the room I will put it in. 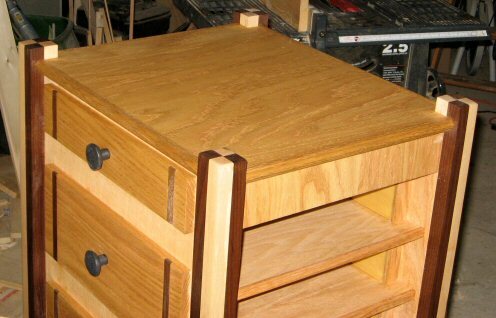 The opposite side, however, has a set of openings that hold drawers for storage purposes. The drawers open towards where my wife’s home office space is located and can be seen only from that direction. The openings to the side of the table were sized to hold storage drawers we found at an office supply store. 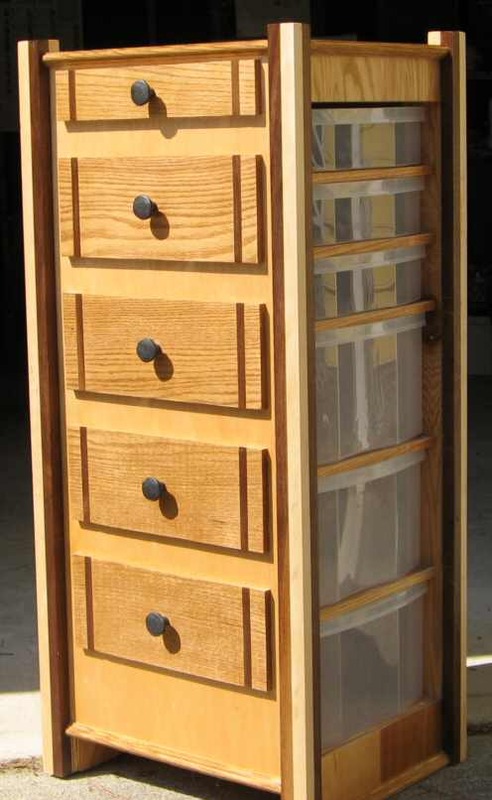 I intend someday to make wooden drawers to replace the plastic ones, but these will work for the time being. In order to preserve the contrast between the walnut/maple columns and the rest of the table, I sanded them thoroughly to remove smudges and then applied several layers of natural stain to bring out the colors. 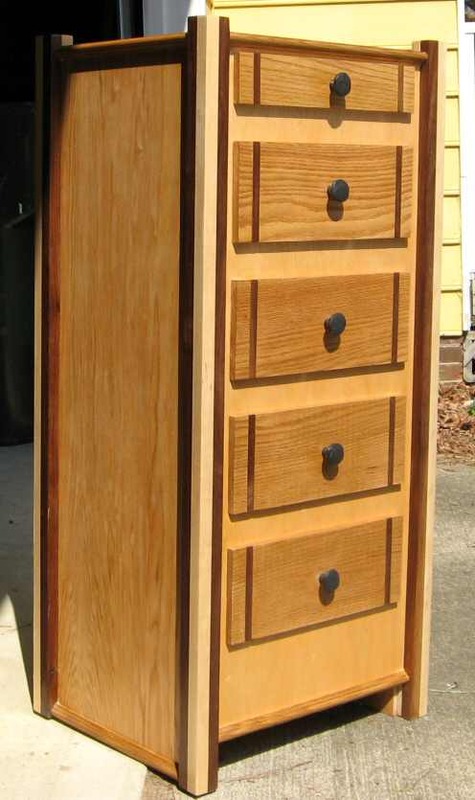 The walnut inlays on the fake drawer doors got extra stain as well. 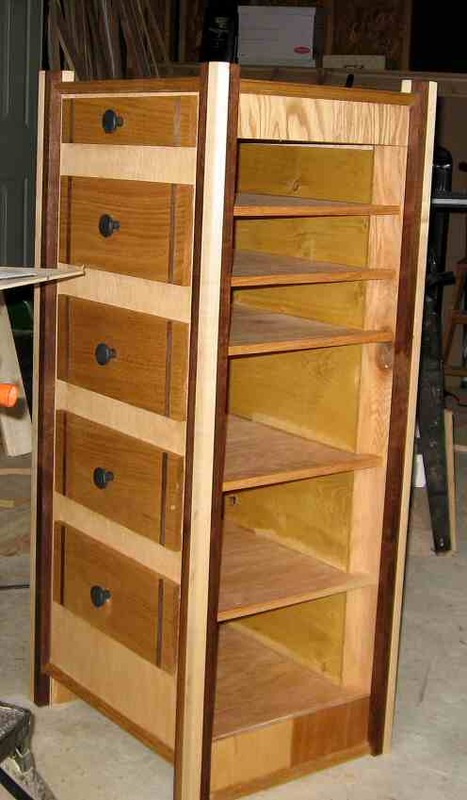 All that’s left is to apply protective clear coat to the entire table and add the drawers in the openings. Looking down on the top you can see how the different types of wood and stains help bring out the decorative aspects of the columns. I wanted a lot of contrast between the wood in the columns and between the columns themselves and the rest of the table. The false drawer fronts also have walnut trim to further accentuate the columns.